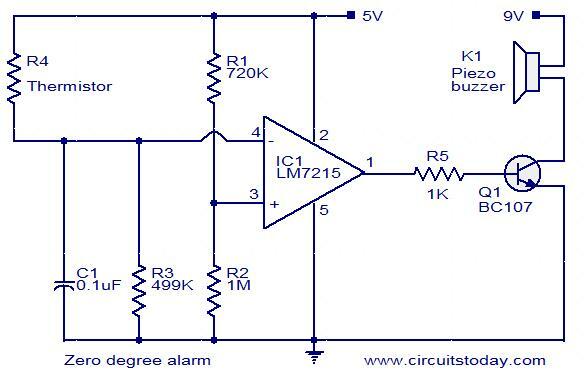 This simple circuit will produce an alarm whenever the temperature falls below zero degree. A thermistor is used here to sense temperature. The op-amp LM7215 is used to compare the reference voltage and voltage from the thermistor network. Reference voltage is given to the non inverting input (pin3) of the IC and voltage from thermistor network is given to the inverting input (pin4).When temperature becomes less than zero degree the voltage at the non inverting input becomes larger than the voltage at the inverting input and the output of the op-amp becomes high. This makes the transistor Q1 ON and drives the piezo buzzer to make the alarm. 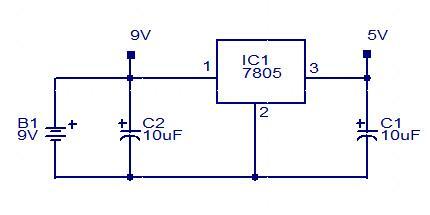 In the power supply section, IC 7805 is used to derive 5V from the 9V battery. The thermistor used here is a glass bead thermistor, type No: KEYSTONE RL0503-5536K-122-MS (361K @ 0 degree Celsius and 100K @ 25 degree Celsius). The battery B1 can be a 9V PP3 battery.